Tight pin hinge with the enclosed spring is for left or right mount applications. Designed for full surface applications. Set includes: 1 pair #122 spring hinges, 1 - #2 hook and eye, and 1 - #2 pull. Steel hinges, hooks, eyes, and pull. Visual-pack. Includes: 1 Pairs #1 Spring Hinge, 4-3/4" Door Pull, 2-1/2" Gate Hook & Eye. Set includes: 1 pair #129 hinges, 1 - #2 hook and eye, 1 - #2 pull, 1 - #76 spring with hooks, all mounting screws. Mounting options: full surface, half surface and offset applications. Holes are countersunk on both sides. Pins are removable for easy door installation. Steel hinges, hooks, eyes, and pull; steel wire spring. Set includes: 1 pair #129 hinges, 1 - #2 hook and eye, 1 - #2 pull, 1 - #76 spring with hooks, all mounting screws. Mounting options: full surface, half surface and offset applications. Holes are countersunk on both sides. The pins are removable for easy door installation. Steel hinges, hooks, eyes, and pull; steel wire spring. Visual-pack. For hanging lightweight wood screen doors in full surface or mortise applications. Includes 2 hinges, door pull, hook & screw eye, coil spring, and screws. Includes: 3 - Spring hinges, 1 - Door pull, 1 - Door knob, 1 - Hook and eye latch, Mounting screws. Designed for full surface applications. 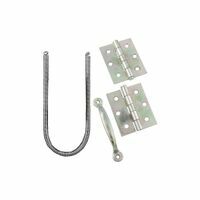 Non-removable pin hinges are with the enclosed spring for left or right mount applications. Complete kit for vinyl or wood screen doors. Knob and lever are non-operative. Visual-pack.